This is a photograph that I took in Provence, on our way down to the South of France. It would be used as the July 2004 front cover of the Morgan Sports Car Club’s magazine “Miscellany”, which I was writing an article for. 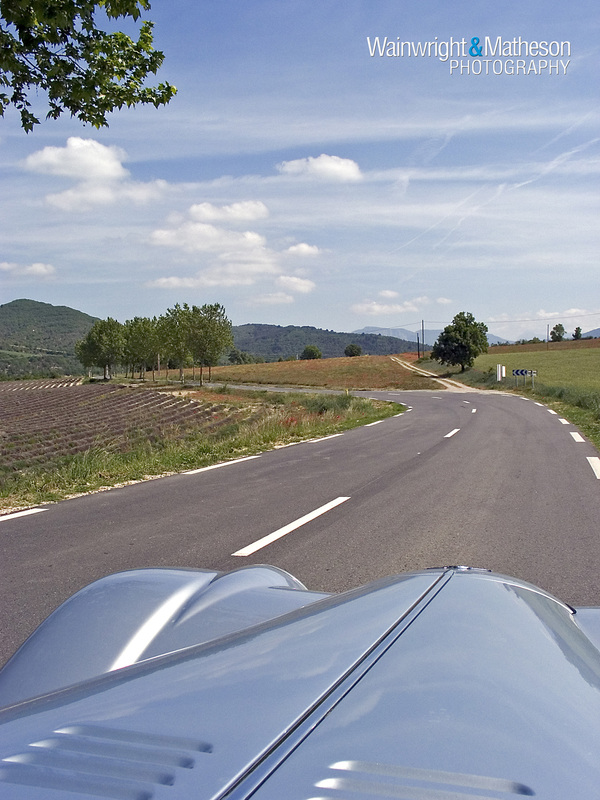 Most French roads are much quieter than British roads – until I started driving cars over there, I didn’t really appreciate just how big a country it is. The Route Napoleon runs from Grenoble down through the Alps and ends in Grasse, just to the north of Cannes. It follows the route that Napoleon Bonaparte took when he returned from exile in Elba. It is one of the most exciting roads that I have ever driven on, demanding total concentration at all times. Just before we started climbing into the “proper” Alps, we were travelling along a gently winding stretch of road, with lavender and poppies growing on either side and I spotted a view that I knew would make the perfect magazine cover. I stopped the car and rested my Canon Powershot G3 on the top of the windscreen and used the camera’s fold out screen to help me compose the shot. I wanted to get part of the Morgan’s louvred bonnet(s) in view and then draw the viewer’s eye into the left-handed corner and on towards the small avenue of trees towards the edge of the photo. As soon as I took the shot and saw it in the camera’s screen, I knew I had a winner. Traditional Morgans don’t have a boot and even the Aero models only have boots that will take a couple of holdalls, so space was at a premium on this trip. There was no way that I could carry a DSLR and lenses, so I took what I called my holiday camera – a Canon Powershot G3 along with us. Remember, this was ten years ago and the camera produced a mere 4 megapixel image, which is less than most modern smartphones. But it was still a good enough image to be used for an A4 size magazine cover. I used the camera throughout the trip down to the South of France and back up to illustrate my article. If there is a moral to this story, it’s that you shouldn’t underestimate the potential quality of a photograph that compact cameras can achieve. These days, I use so much kit that I have to wheel it round in a roller bag but there are times when carrying very little kit makes it more likely that you are going to see the shot and grab it. Photograph taken 25th May 2004 with a Canon Powershot G3 and the equivalent of a 35mm – 140mm lens set to 35mm. Exposure 1/800 second at f 5.0. ISO 50. Here are some links to web-sites that we link to because we feel they’re worth visiting.